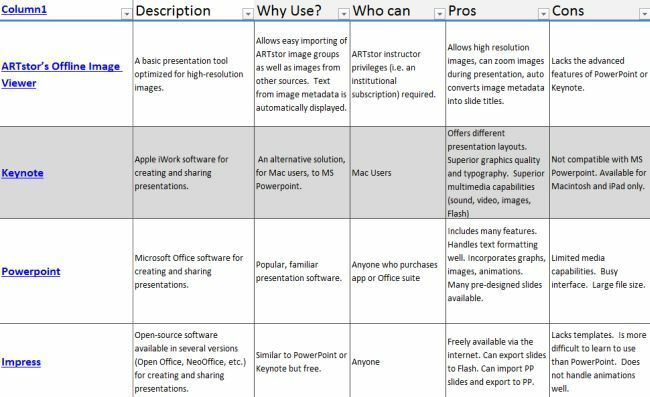 The following document shows an overview of a selection of the most often used presentation tools, including a brief description and a few pros and cons for each one. Click the link above to see the full document, which includes tools not shown in the image below. Use the box below to find links to websites for the tools themselves. See the chart above for an overview and comparison of many of these tools. Use the links here to find more information on each one. Pachyderm- Uses forms and templates to create interactive presentations with minimal work. Allows viewer to explore information according to interest. Intended for institutional use; requires local server and configuration support. Google Slides- Free online presentation authoring and sharing tool. As part of Google Docs, it allows for easy collaboration and sharing. Zoho Show- Free online presentation authoring and sharing tool. Features powerful shapes-based graphic creation tools. Allows remote presentations. SlideRocket - Online presentation authoring and sharing tool optimized for high resolution images. Basic features are free. Slideshare- Free web-based service that allows uploading and sharing of presentation slides and audio. Includes tool to sync audio with individual slides. Has also social features allowing users to follow and comment on favorite presenters, topics, etc. Authorstream- Free web-based service that allows uploading and sharing of presentation slides and audio. Includes PresentLive feature that lets viewers follow and chat about your live presentations on their own computer. SlideBoom - Free web-based service that allows uploading and sharing of presentation slides and audio. SlideServe - Upload and share PowerPoint presentations publicly or privately. SlideSix - Mulitmedia online presentation creation and sharing. Edit, and share your PowerPoint (PPT), OpenOffice (ODP), and Keynote presentations.